Taco Hunt turns 1 year old. So ya I got a few funny looks from the other taco truck patrons when I pulled out a candle and lit it on my taco. And yeah even a few more funny looks when I blew out the candle. It was one year ago today I posted the Mission statement where I declared that no part of the city was safe from the taco bandini. Well some cities escaped my taco reporting. Long Beach, I’m putting you on notice. But it’s been a good year. 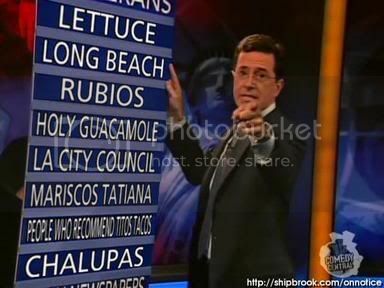 76 taco establishments on the board almost 200 tacos consumed and only one upset stomach. Since the day I set out on this journey I’ve become a more adventurous taco eater. I’m no longer afraid of the cabeza and lengua.Sesos still freaks me out though. There are still many famed taco establishemts to get to. Cheo's in El Sereno, El Taquito mexicano in Pasadena, Tacos Baja ensenada, Taco Nazo...the list is long. Congratulations on the first year of The Great Taco Hunt! PLEASE keep up the good work! Hapy Taco Birthday Bandini! Make sure you get to El Taquito Mexicano soon...one of my all time favorite trucks! Congrats on your milestone Bandini! so after one year what's been your favorite? Congratulations! Seriously, you are doing the Lord's work- don't ever stop!!! Bandini! Happy Birthday! You have changed our lives with your vivid and insightful taco reports! 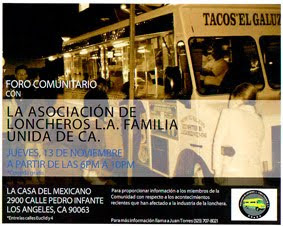 Speaking of Loteria, a few of us Knitter Gals would like to invite you to the Original Farmers Market on a Thursday evening to try the tacos at Loteria Grille. Let us know which Thursday works for you! Happy Birthday, Bandini. Even over here in Europe you are read and smiled over taco after taco. Keep on trucking..uh..taco'ing. Congratulations, Bandini. Yours is the blog I send to out-of-towners to make them jealous of LA. I raise my ice cold tamarindo to you and wish for another ten years of taco journalism! It's the "People That Recommend Tito's Tacos" being put on notice that I don't understand. I've never eaten there, and every time I try to I wind up at Johnnie's Pastrami... But at some point, dear Bandini, you're going to have to do a review of that joint, and several others that you detest. Y'need to highlight a handful of places to avoid at all costs for people who wanna join your taco journey. What, exactly, is sacreligous about their idea of the taco? I recomend the Taco Nazo in Baldwin Park. Now what do I have to do to DRAG you down to the Mecca of Taco-dom, East Los Angeles? Congratulations! I consider your blog to be the Zagats of taco trucks. And don't worry, you aren't missing anything by avoiding the sesos. Lousy texture and no flavor to speak of. Now, Titos? I grew up eating there. Must be the memories I go back for. I am a Mormon. Being of that particular religious affiliation, I associate with a great many Utah natives on a regular basis. (I am proud to report that I have never lived in that benighted state.) Utah, as you may know, is something of a culinary wasteland. When a social gathering is wrapping up and I say, "Hey, anyone want to go get tacos? ", one of these Utahns will always say, "Yeah! Let's go to Tito's!" So there we have it: Tito's is the preferred taco of Utahns. Now honestly, do you need any more reason not to eat there? OK. OK. I know what everyone says about Tito's tacos. I, too, grew up eating them. They're supremely American..ground beef, hard shells, cheese is extra! They're like the tacos that Mom made at home with prepared taco shells in 1969. HOWEVER, the ENCHILADAS at Tito's are not to be missed. They are extremely yummy...the flavor of the sauce is amazing! If the outside window is crowded, try the inside window...much faster. Congrats. I don't know why I enjoy reading about the tacos of a city on the opposite coast, but I do. thank you so much for all your "hard" work!! seriously you have become an amazing resource and are appreciated by all. Congratulations! Your blog has given me the strength to eat from taco trucks all over the city. I'm particularly fond of the one on Rose & 4th in Venice -- they carry guava Jarritos and now I'm addicted. Nevermind. I see that you've already been to La Isla Bonita! Congrats on reaching your one year milestone. I salute you and your noble quest for the Perfect Taco. You are an inspiration to all those who yearn to live and experience the Taco Lifestyle. I look forward to reading more of your Taco Adventures. Congrats on your first year! I'm glad to be a part of the Taco Hunt familia. 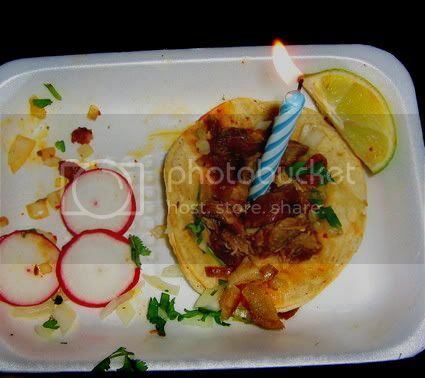 Happy Birthday to the very best Taco site anywhere! Congrats, Bandini. Reslly enjoy your site. Thanks for the good taste, good humor, photos, and writing. Missed you when you were on your (diet) hiatus. feliz cumpleaños señor bandini! keep it up - or down as it were. titos tacos isn't on notice just people that recommend titos tacos. Congrats Great Bandini on 365 days of taco hunting and let's make it many more. My recamendation for the coming up year is Tacos San Pedros in Hawiian Gardens. Thanks for all the hard work!